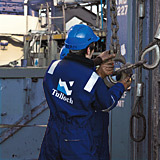 Tulloch Recruitment is a privately owned, multi-disciplined recruitment company based at 506-508 Union Street, Aberdeen. At Tulloch Recruitment we pride ourselves on the high level of expertise and diversification of our personnel. The majority of our senior management team have more than 25 years experience in the recruitment industry and have been with the company since it’s inception. Many of our personnel carry offshore survival certificates and have worked on numerous offshore projects in the North Sea and internationally. Our recruitment professionals ensure all personnel are interviewed, skill tested, assessed and reference-checked in order to assure our service adds value to our client’s business . Our recruitment team also has the capabilities and experience of managing complex multi-disciplined project teams worldwide, both onshore and offshore. Tulloch Recruitments integrated recruitment offering encapsulates the provision of personnel to the: Trades; Industrial; Engineering; Commercial and Offshore industries, as well and frequently executing specialised International Projects for our clients. Senior management focus on establishing and maintaining strong relationships with the company’s client base, which ranges from small privately owned companies to IOCs, as we believe that it is only through developing a comprehensive understanding of our clients needs that we can appropriately meet their recruitment requirements. Please Contact Us to find out what Tulloch Recruitment can do for your company.